Turns out this is a HUGE problem because Linda and her husband, Kip are avid readers. Further, Linda had just gone to a big book sale in Carmel and, because she collects cookbooks, had just sent a crate of books home to Texas. Her husband opened the crate, left the books, and, as if on cue, Harry ate several mouthfulls! Well, Harry and Linda are so well-connected that it was easy to get a “read” on what was going on. I was pretty sure Linda was going to say I was a crazy California airhead, but I told her what was going on. Harry wanted Linda and her husband to read to him. And not just read to him, but read to him daily, and in the living room or the den, not in the bedroom. Surprisingly, Linda did not laugh. She said she would try it when she got home. She also told me that she and her husband read aloud to each other every night in bed, but Harry always stays outside of the bedroom until they are done reading and the lights are turned out. Then he comes in to sleep. I repeated that Harry wanted to be read to in the other rooms, not the bedroom. Then Linda called her husband and told him. Again, I was sure he would laugh it off, but not do what I’d prescribed. Instead, he said he thought Harry was a Dickens kind of dog. What a guy! I hope my message finds you doing well. It truly was a pleasure spending time with you and getting to know you better. 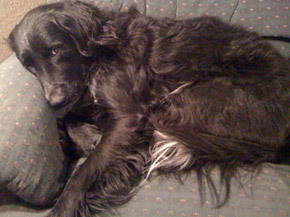 I’m dying to tell you about Harry (Border Collie /Labrador Retriever mutt) so I’ll get right to it! Harry has not chewed a book (or anything except one cookie box from the recycle bin which I’m ashamed to say I don’t discourage because it’s better than books!) since I’ve been home!! I had already told Kip about what you had said about reading to Harry when I was still in California and he was all for it. The very first night back, we got Harry to lie close to us in bed and we started to read to him. First we made a big deal about showing him the book and the binding (the most delicious part apparently) and letting him smell the book as long as he wanted. Then we read to him. He listened intently for about ten minutes before jumping off the bed like he had been shot out of a cannon – his usual speed – but we were quite pleased that he had sat still that long and listened to us reading. We’ve been doing it once a day including when I go home at lunch time – and so far he has chewed no books!!! Adrienne, I must tell you that though I was never skeptical, I didn’t think it would work this quickly!! I will keep you posted but I am feeling so positive and hopeful about this. It’s been going on for three years and there are few “things” I care about as much as I do my books and it would be such a relief to know that he was done with this habit. Thank you for caring and giving it thought and coming up with something that would never have occurred to us or ANYBODY we know. Harry thanks you too because he really wants to please us. Well I better get back to the grindstone here because unlike Harry – I can’t get by on my looks! All the best to you Adrienne – I look forward to seeing you the next time I’m out your way. Oh, I forgot to mention…Linda signed her second letter with her full name…LINDA READ! Thus far, no more books have been eaten in the Read household. Smart boy, that Harry. Great people, too, Linda and Kip!